GDG Macros, CorelDraw VBA Macros, Visual Basic for Applications in Corel Draw, Macros for you! Please order a commercial macro ONLY if you have at least intermediate professional experience with CorelDraw and macros, no beginners PLEASE. Try FREE macros here and see my help pages to learn. Clients agree to all terms and conditions here when buying a commercial macro and using the available free macros. No refunds, no exchanges. Note: Macros do not function in the Home & Student Edition or Pirated Versions of CorelDraw! Many CorelDraw 2019 macros are here! Join ME on Facebook to stay up to date with news, updates. Subscribe to my YouTube Channel for tutorial videos and tips. Need a custom macro? Contact me. WINDOWS OS ONLY! Not all macros are guaranteed to be continued due to compatibility reasons or other. See new version policy here. Contact me and let me know which macro you need for the NEW CorelDraw 2019. All macros without requests could be discontinued. Note: This version is for CorelDraw version 2017 Only! It will not work on any other version. A great macro for sampling colors in a document. With a click on the color that appears in the form, the macro instantly selects all objects with same colors. Once you use it you won't be able to live without it. Features include: Form generates buttons that are all colors in your selection, or the entire page, your choice. Clcik a color on the form and all objects in either the selection or all page, that have that same color are selected. 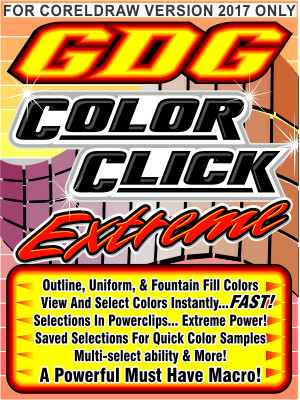 New in version 3: Selection group sample presets, ability to sample colors inside powerclips, ability to make extremely complex selections of items on the page, and multiple color selection mode. Fountain fills can also be sampled and colors inside them changed throughout multiple shapes at once. Commercial Macros Full Listing, See All v.2019 Macros. Commercial Macros Full Listing, See All v.2018 Macros. Commercial Macros Full Listing, See All v.2017 Macros. Commercial Macros Full Listing, See All X8 Macros. Commercial Macros Full Listing, See All X7 Macros. Commercial Macros Full Listing, See All X6 Macros. GDG S4 for X6 Stripe, Size, Split, Space! Commercial Macros Full Listing, See All X4-X5 Macros. FREE Macros! Full Listing... See Em All! Helpful VBA Code! Full Listing... See Em All! My quick attemp at filling a shape with circles or stars. Policy & Terms apply to all orders.